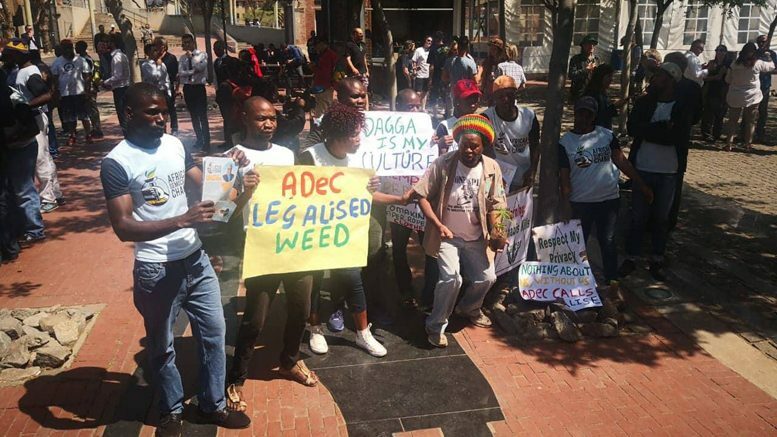 Crowds gathered in front of South Africa's constitutional court to support cannabis. Represented were entrepreneurs, traditional healers associations and several political parties. Plenty of barriers still face the startup of a hemp industry in South Africa, but last week’s decriminalization of all cannabis by the country’s constitutional court means new hope for development based on the crop, stakeholders said in the wake of the ruling. “Coupled with the recent moves by the South African Department of Trade and Industry (DTI), it helps put S.A. on track for a vibrant hemp economy,” said Tony Budden, long-time South African cannabis activist who managed to change his travel plans last minute to attend the court’s judgment, and the celebration that followed. The DTI recently announced that it is investigating the potential for hemp in a number of applications and sectors, with Minister Rob Davies saying his department recognizes South Africa can become an innovative player in the fast-growing global markets for hemp. Other initiatives are advancing as well, with the court’s judgment coming at the same time the Cannabis Development Council of South Africa (CDCSA), a new industry body, was celebrating its official launch with a festival in Chintsa, Eastern Cape, one of the country’s poorest provinces but famed for its cannabis growing. CDCSA’s aim is to create viable frameworks for cannabis production and incentivize hemp value chains, while assisting policy making in reshaping current laws. And the S.A. Department of Agriculture, Forestry and Fisheries recently announced it established an interdepartmental team to help set up regulatory frameworks for industrial hemp. “Much progress had been made in terms of dealing with technical matters regarding production of hemp, research and technology development, commercial feasibility and other related matters,” Senzeni Zokwana, Minister of Agriculture, recently told the news24.com web site. The developments mean things could finally be moving for hemp in South Africa, an industry laggard, after an open letter to the constitutional court endorsed by several SA cannabis stakeholders earlier this year bemoaned a lack of progress. Many say that the industrial applications of hemp are where the true, long-term empowerment potential of the crop lies, but it’s nonetheless likely that production in South Africa will initially focus a great deal on cannabinoids, including CBD, but also on speciality cannabinoids like THCV, which is found in abundance in South Africa’s heritage strains. Jason Law, of the Cannabis Development Council of South Africa, said that he was pleased with the court’s judgment, but that much work still needs to be done to establish a cannabis industry in the country. And he urged stakeholders to make rural development a priority. “This crop is ideally suited to uplift the rural poor, and commercial players should realize that they will not escape their social responsibilities” he said. Law said he expects to see at least 500 hectares of hemp planted in his home province of the Eastern Cape this season. Last week’s ruling, delivered by Chief Justice Ray Zondo, declared South Africa’s cannabis laws to be constitutionally invalid, and said parliament must enact two separate laws that decriminalize private adult cultivation and personal consumption. The unanimous ruling gives the South African parliament 24 months to enact the changes. South Africa is unique in the world in pursuing cannabis legalization in the constitutional court. The country is often praised for its encompassing constitution, and many say that this constitutional strength was proven with decriminalization of cannabis. The court case is a culmination of three separate cases, and a previous judgment in the Western Cape high court that found that current laws surrounding cannabis encroach on an adult’s right to privacy. The court did not dictate what amounts constitute personal use, declaring that these limits are up to parliament to decide. However, the judge left it for police officers to decide what would be reasonable quantities for personal use. Garreth Prince, one of the original applicants in the proceedings, praised the court’s ruling overall, and said he hopes it wakes South Africans up to “make use of their rights.” He added that cannabis belongs to all South Africans, and it is up to them to decide the plant’s future. Jeremy Acton, another applicant, was seen educating a group of school children about the crop just before court proceedings started, and was swamped with media following the judgment.